This week's release is all about improving the first time experience for new users. The settings are now an expandable region in the activity page, and pop open on first use. I have also hidden the size options so that fewer options are presented immediately. Press the 'settings' link to reveal the settings, and press 'hide settings' to hide them again. Each '?' reveals extra information about the setting, and the size options are hidden behind the 'advanced' link. I changed the status indicator so progress is fed back quicker once you have changed music library. 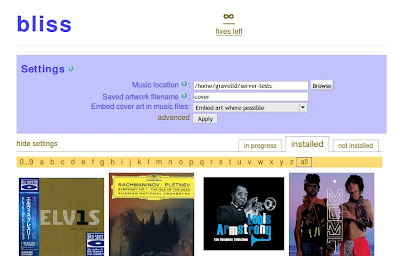 For large music libraries there would sometimes be a noticeable gap between starting bliss and getting any information back that bliss had even started scanning your music library. Finally, a bug in the Amazon art downloader has been fixed which may have caused bliss to hang under certain situations. Not good, but fixed now! As usual, existing licences will work for this release.